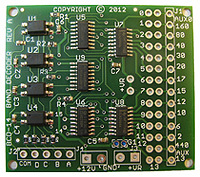 Unified Microsystems specializes in developing unique products for Radio Amateurs and modules for electronic engineers, students, and hobbyists. SCI-6 PC Sound Card Interface Kit. Looking for an affordable PC sound card interface to get you on PSK31, RTTY, WSJT, Echolink and other exciting digital modes? The SCI-6 interface kit is your ticket! The BT-75 Beverage Transformer is your first step in building a wire Beverage antenna that really pulls weak DX signals out of the noise. Designed for long term reliability, the output is designed to match low loss 75 ohm RG-6 CATV coax for maximum performance at the lowest cost. RXT Terminators. A low noise receive antenna is a key to low band success. Regardless if you have a long Beverage antenna or one of the smaller loop types, it needs to be properly terminated for optimum performance. The rugged RXT series of terminators are available in several values covering the most popular low band antennas. The XT-4 is a battery operated CW keyer. Four memories let you store your Morse CQs and contest exchanges. Its small size is great for Field Day, DXpeditions, County Hunting mobile operations, VHF rover and other portable operations. The ML-6 Replacement Meter Lamp will put an end to burned out meter lamps on your Hy-gain™ or CDE rotor control box. This small circuit board utilizes 6 LEDs to provide bright, even illumination of the front panel meter. It is easy to install and has adjustable brightness. The BCD-14 Band Decoder / Antenna Selector are designed for hams building their own custom automatic band switching systems. It uses the band data output of the Elecraft® K3, certain Yaesu® transceivers, or PC logging programs to automatically select the proper antenna or band pass filter when changing bands. The HSD-9 High Side Driver board is the easy way to adapt a BCD-10 or other low side switching band decoder to a high side antenna or filter switch. The XT-4BEACON is the perfect start for your VHF/UHF beacon or other project requiring a CW IDer. Just plug in your keyer paddle and program your ID message. Its long, non-volatile memory space allows messages up to 90 seconds at 25 WPM. The The ATS-1 Terminal Shield is the quick and easy way to add a user interface to your Arduino™ project! The Terminal Shield provides a 16X2 alphanumeric LCD display, 6 user navigation buttons plus a programmable LED and buzzer. Better yet, it only uses 2 of the Arduino's digital I/O lines, leaving the rest for your application! If your project needs more digital I/O lines, the IOX-16 I/O Expander Shield will give you 16 more on a single Arduino™ compatible shield. Stack up to 8 shields for a total of 128 more I/O lines! The VR-x Series of Power Supply Regulator Kits will make short order of the power source for your next home brew project. Does your next project require an array of LEDs? You supply the LEDs and the LA-10 kit provides a circuit board and constant current drive components in an easy to build kit. The BCD-10 is a band decoder for certain Yaesu and Elecraft K3 radios. It has been replaced with the newer BCD-14. The UCW-100 and UVK-200 are new USB interfaces. You are probably running out of COM or LPT ports on your current PC, and your next PC might not have any at all! Go USB instead! Control your VK-64, send CW, or control PTT with your sound card interface for the digital modes. The VK-64 is a voice keyer and CW memory keyer in the same package! You can operate the VK64 manually with the front panel controls, or under software control through your PC or laptop's printer port. The W9XT Contest Card is a voice keyer and CW interface that plugs into your PC. Record your CQs and exchanges in your own voice and play them back with a press of a button. Save your voice during phone contests!